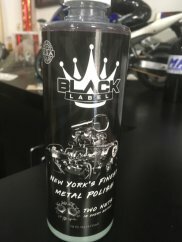 BEST Aluminum Polish - "The Brooklyn Ball Buster"
This is absolutely the BEST aluminum polish we have found to date. Keeping your polished bike looking like the day you got it has always been a chore - until now. BLACK LABEL - and yes, there are two nuts in every bottle! Limited supplies available! This is the stuff we have been waiting years for, available again from POWERHOUSE MOTORCYCLES. Click images above to see the results of using this fantastic product. CAUTION: File sizes are extremely large so you can see the quality detailing you can do using Ball Sauce. The bike frame and swingarm pictured here are aluminum! © 2004 - 2018 - All images and content on this site copyright of Powerhouse Motorcycles, New York. Unauthorized use of these images or content without written permission of Powerhouse Motorcycles, New York is an infringement of copyright law and will result in legal action. All rights reserved as protected by Federal copyright laws.